The following story: A Man and His Dog Go To Heaven, is an adaptation of the wonderful tale by Earl Hamner Jr., an American television writer and producer. This particular tale came from one of his teleplays for the Twilight Zone series titled - The Hunt, which originally aired on January 26, 1962. The story is about a man named Hyder Simpson, who refuses to go into heaven unless he can take his dog Rip with him. "Welcome to Heaven". It was then the old man realized he and his dog were dead and traveling down Eternity Trail. They both were hot and very thirsty as they had been walking for a long time. The old man was so happy to be at Heaven's gate. He started to enter with his dog following him but the gatekeeper stopped him and said: "I'm sorry, but dogs are not allowed in Heaven so he can't come in with you", as he gestured towards the man's dog. The old man replied: "But my dog has been my faithful companion all his life. If my dog can't come in with me, then I will stay out too. I will not desert him now, not even to enter Heaven." The gatekeeper replied: "Suit yourself, but I must warn you, the Devil's on this road and he'll try to sweet talk you into his area. He will promise you anything to get you to enter. So if you don't leave your dog now and come in, you will spend eternity on this road hot and thirsty or end up in Hell." But the old man still refused to enter and continued walking along the dirt road with his dog. "Excuse me Sir. My dog and I have been on this road all day and are very hot and thirsty. Would it be okay if we took a much needed rest under your shady tree?" "Of course", the other man replied. "There's some cold water under the tree too. So please come in and help yourselves." The old man asks: "Are you inviting my dog too, because I won't come in without him. In fact, that's why I chose not to go to Heaven because I was told dogs are not allowed." The man smiled and said, "Welcome to Heaven, and bring your dog!" The old man exclaimed, "You mean this is Heaven? And dogs are allowed? How come that fellow down the road said they weren't?" "That was the Devil and he gets all the souls who are willing to give up a life long companion for a few small comforts. Those who choose that route soon find out their mistake but it's too late. The dogs always find their way here and the fickle people who abandoned them stay in Hell, for eternity." "You see my friend, GOD would not allow dogs to be banned from Heaven. After all, He created them to be man's companions in life, so He would never separate them in death." A Man and His Dog is a tale of loyalty. Our dogs stand by us no mater what. Even when faced with danger or disaster, our dogs are always there in our time of need. Don't they deserve the same from us? 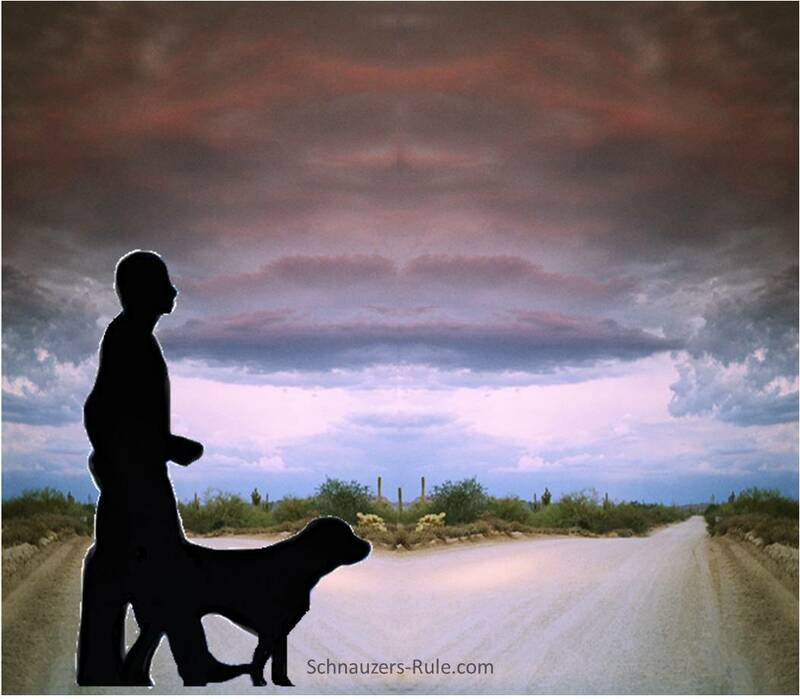 Enjoy further reading about man's best friend, the faithful dog. Will Rogers Quote: If there are no dogs in Heaven, then when I die I want to go where they went. Love leaves memories no one can steal. We will never forget our treasured companions, our beloved Miniature Schnauzers. A magical little book that honors the timeless connection between people and their canine companions. 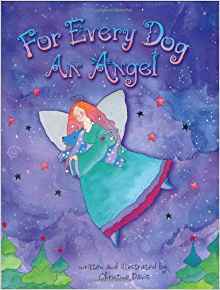 This charming book will bring comfort to anyone who has ever had to deal with the loss of a pet and having to say goodbye to their best four-legged friend.